My name is Florence Gillet. I believe that eating challenges are in fact the doorway to a deeper, unanswered emotional hunger. I believe women have an essential role to play in society, but that the current cultural focus reduces them to body parts they need to perfect. This, in turn, robs them from humanity, from standing their ground and reaching their potential. Instead of striving for self-acceptance, women bond over fatphobia, diet and exercise tips. They dedicate their lives to shrinking themselves. But there is another way. I want you to embrace food freedom and body wisdom. I want you to dig deep into what you are truly empowered to do in the world, in order to become a happier, more nourished version of yourself as an individual and radiate this energy to others around you. I want to create a safe space for all to exchange on mental health and body image. I want you to leave behind superficial body goals. Instead, I want you to foster a deeper awareness of your intuition, for yourselves and for the next generation of eaters following you. It is a journey I started in 2016, after a decade of chronic dieting and a lifetime of low self-esteem. In 2018, I was certified as a Body Mind Nutrition coach by the Institute for the Psychology of Eating. My work combines practical coaching techniques with results-oriented psychology. It fosters body centered practices and a positive, compassionate approach to challenges with food and health. I am a feminist ‘Health at every size’ practitioner, who is also passionate about social justice and ending weight stigma. Through my own experience and my coaching practice, I have gathered tips and an experience-led framework for you to join me Beyond Body Image. Let’s not only rewrite our own stories but those of our children too! 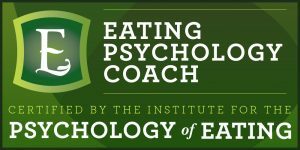 The Coaching I provide is derived from a cutting edge approach developed by the Institute for the Psychology of Eating. It effectively addresses eating and body image challenges in a positive and empowering manner, and allows me to fully explore some of the personal dimensions in your life that impact food, weight and health. Oftentimes, our eating challenges are connected to work, money, relationship, family, intimacy, life stress, and so much more. By working on the places that are most relevant for you, I look to support you with coaching strategies and nutrition principles that are nourishing, doable, sustainable, and that yield concrete results. I’ve learned to help clients reach their highest goals not by strategies that punish, but through strategies that nourish. My work combines the powerful fields of Dynamic Eating Psychology and Mind Body Nutrition. Dynamic Eating Psychology is a positive, empowering and transformational approach that’s designed for anyone who eats. It recognizes that our challenges with eating, body image, and health are intimately connected to other primary life dimensions – relationship, family, work, sexuality, our search for meaning and fulfillment, etc. Mind Body Nutrition advances the practice of clinical nutrition by exploring the psychophysiology of how thoughts, feelings and beliefs impact nutritional metabolism and health. Simply put, what we eat is only half of the story of good nutrition. The other half is who we are as eaters. Mind Body Nutrition offers practical and results-oriented strategies for many eating challenges and health concerns.